Thank you everyone for entering. My generous heart wanted to give everyone a laminator--including myself. But don't worry, I will have another giveaway when I reach 200 followers--and it may even be another laminator! 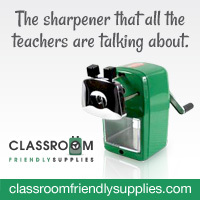 I was also thinking of giving away that really cool pencil sharpener that everyone keeps bragging about. As for the Lego jar. There were 22 minifigures in the jar. If you guessed correctly, you got five extra entries. Deniece did guess correctly! I think that probably helped her win! I can't believe it has been over a week since I last blogged. But I do have an excuse. We went on a vacation and came back home with only one day to spare. We flew west on Thursday, and flew back to Illinois on Monday night. We arrived inside our house at 1am. (That was after waking up at 4 am to start our journey.) Sometimes I just don't think flying stand-by is worth it. I guess that is why I'd rather drive to the East rather than fly. But we did get to climb a mountain. We also were able to see cousins we don't see very often and form new friendships. There is Joshua on the side of the mountain! He loved the hike. We kept having to go back and forth between the turns until we reached our destination. When we arrived home, we had to get ready for school. We were so out of sorts, I don't think we even did first day of school pictures. Maybe we will try first full week of school pictures? So hopefully, I will start to get used to the new routine--and come up with some fun ideas. I can't wait to see your ideas as well! Wow, that is awesome! What a fantastic way to begin the school year:) Yippie:) I sent you an e-mail. BTW, I'm posting pics of my room!